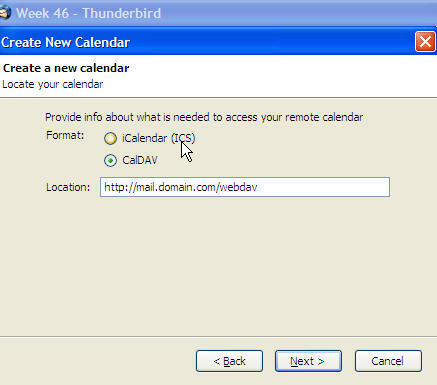 If you are running or want to run Thunderbird as your mail client but also want the ability to view and sync your personal and shared calendars, you will need to use the Lightning plug-in for Thunderbird.. You can download it here. Firts make sure the WebDav service is running in System > Services in the Icewarp console. It will ask you for the login to mail server. You will need to enter your login in order to contact the database to pull down any calendar information. If you login with the full address then make sure you use that and the same goes for the username login, use the exact format as you use to authenticate to the mail server. Once you have added the calendars and authenticated to the server you will then see events displayed. From this point forward it will automatically sync with the Groupware database to pull any new events. The sync works in both directions. If you add an entry through Thunderbird it will sync to Webmail.